Human Relations Administration majors can refer to the following information for help in navigating major requirements, internship experiences, career paths and graduate school options. For help with these topics, students are welcome to visit the HDFS Advisement Center or meet with their faculty advisor. Human Relations Administration majors complete two field experiences, gaining valuable work experience in their related fields of interest. These internships provide our students real-world experience and can often lead to employment after graduation. HDFS Internship Database (password protected): This database includes a list of potential internship positions with partner organizations. Students in this major may pursue careers in human resources and non-profit administration in roles such as recruiter, benefits coordinator, training manager, compensation specialist, vocational counselor and more. Students may also be interested in furthering their education in various fields including Human Resource Management, Business Administration, Public Administration, Social Work, Organizational Psychology or Counseling. 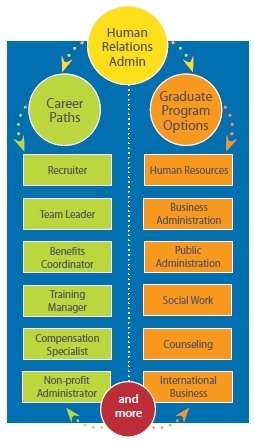 Visit your academic advisor or the Career Services Center to learn more about these pathways.